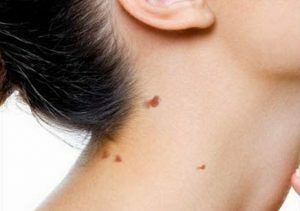 Skin tags are made up of loosely arranged collagen fibres and blood vessels surrounded by a thickened or thinned-out epidermis. Seborrhoeic keratosis, viral warts or molluscum contagiosum may resemble skin tags. Sebaceous hyperplasia is benign over-growth of normal oil glands (sebaceous glands) of the skin, usually seen on the forehead, temples and cheeks. They typically appear skin-colored or yellowish and have a central “pore” or follicular opening. How can my sebaceous hyperplasia be treated? Sebaceous hyperplasia can be effectively treated with fine-needle electrocautery, a painless procedure that may or may not require local numbing injections. Occasionally, slightly lighter or darker pigmentation may occur at the treated areas, this usually resolves over time. Darker pigmentation can be lightened with fading creams. Laser Skin Resurfacing, in which a laser removes the outer layers of the skin is also effective for removing sebaceous hyperplasia and leaving the skin smooth and rejuvenated.